This fairy is ready to put a spell on you...better colour her in, quick! Here's a cool fairy that looks after the groups of mushrooms called fairy rings. This fairy coloring picture features the bitterroot fairy, named after the desert plant with the beautiful blooms. Add colour to this nature-inspired fairy! Your child will enjoy coloring this basketball fairy. Does your child love reading all about fairies and fairy tales? Here's a coloring page that's sure to please. Your child will have a blast coloring the image of the football fairy! 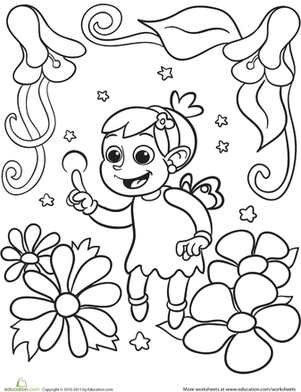 Your child will enjoy coloring this tennis-playing fairy! Colour in this fairy as she lounges on the beach and relaxes in the summer sun. 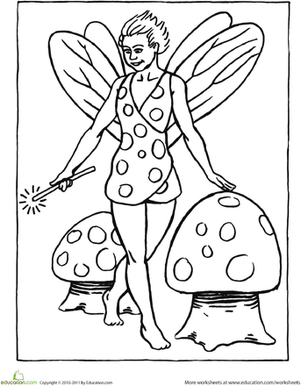 This coloring activity will allow your preschooler to shade in a Frisbee-playing fairy. There are no limits when it comes to the world of fantasy. Activate your child's imagination by having her colour an adorable bumble bee fairy. This pretty coloring page of a fairy and peonies will be fun for your child to colour, especially if she likes pixies and fantasy. Your child will love coloring in this fairy modeled after Cupid and the hearts surrounding her using pinks, purples, and reds.